The Ferea Lamp by Vistosi has been designed by Emmanuel Babled. 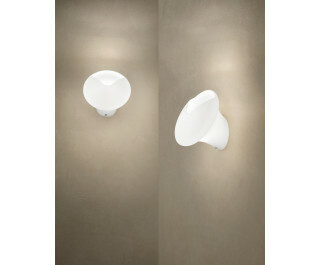 The Ferea lamp is part of a collection of lamps with the diffuser in satin white blown glass. The two cuts are realized with an exclusive water jet cutting system at very high pressure. A unique design has been made possible by the use of the waterjet cut that allows the designer to explore and create shapes that have never been possible before.